Shelby, NC, November 28, 2017– DeRisi Racing is proud to announce that their sponsored GNCC XC1 Pro Landon Wolfe who finished out the 2017 season with a 6th place overall position will be competing on a DeRisi Racing built and suspension tuned factory BRP backed Can-Am Renegade 1000XXC in the 4X4 Pro class for the 2018 season. DeRisi Racing’s Mad Scientist (James Reeves) will be handling all of Landon’s race preps for the 2018 season. 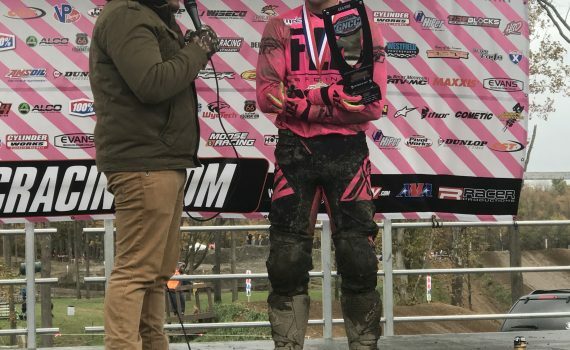 As many already know, Landon raced one of Dwight Pollard’s machines at the final GNCC Ironman race and came out with a first in 4×4 Pro class and the overall win. With this deal comes many benefits for us as a company and for our customers as well because of the advancements we can make in our products and services. We will be able to get race to race feedback on suspension and be able to monitor component wear/durability which in turn makes it where we can design a more superior setups and products for our racers or normal riders alike. With this, we will have three 4×4 pro riders under our banner with our full build and suspension setup as well as many other racers throughout the A and B classes. DeRisi Racing is a powersports company that has been in business for over 18 years doing suspension tuning and service, motor upgrade and rebuild, full race builds, and aftermarket parts sales for racers and recreational riders. These services and more are available for ATVs, Motorcycles, 4×4, UTV and Snowmobile. We have had countless race winning setups throughout the years in GNCC, WORCS, IXCR, Mideast XC, VHXS, Midwest XC, Crossroads XC, WNYOA XC, District 6 and many more. Whether you are trying to get a part for the race coming up or need to get out with your friends for a weekend ride we are a powersports shop dedicated to customer service and satisfaction. If you would like more information about this topic, please contact Santo DeRisi at 704.538.3512 or email at info@derisiracing.com.